At the beginning of 2017, we launched our Public Lands Pledge initiative. So every time you've bought one of our products, we made a promise to donate a portion of each purchase to organizations that support our national parks, state parks, or other beautiful publicly-owned outdoor places. As we've said time and time again, we value transparency and accountability, so we want you to know that we've followed through on our promise. We've tallied up the donations for 2017 and we're excited to tell you more about where your money has gone. Keep in mind, it's our first year of this pledge and also our second year of being in business. 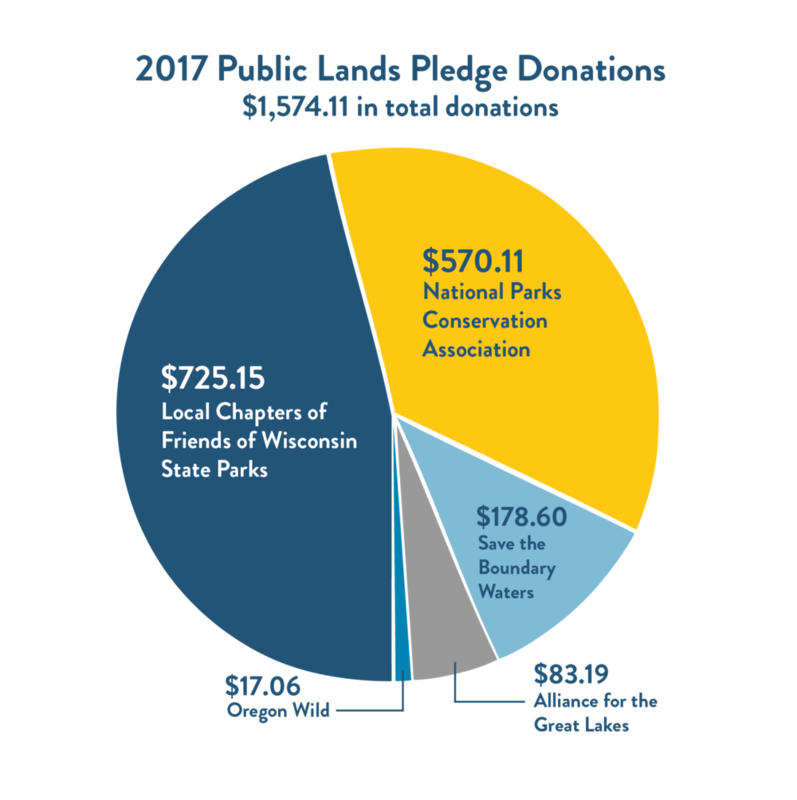 But thanks to customers like you, we're pleased to say that we've been able to donate $1,574.11 to these public lands pledge organizations. We also promised to donate a portion of our various national parks and public lands-themed products to the National Parks Conservation Association. Founded in 1919, the NPCA works to protect and preserve our national parks for present and future generations. We believe that their work is extremely important in protecting the parks that are part of our American fabric. So we're elated that 36.22% of our total donations went to the NPCA, to help conserve our national parks for years to come. NPCA's board of directors agreed to match donations made by year's end, so our total donation with match was $951.14. A portion of our Minnesota and wilderness-themed products went to Save the Boundary Waters, a non-profit dedicated to protecting northern Minnesota's Boundary Waters Canoe Area Wilderness from proposed sulfide-ore copper mining that would irreparably harm this beautiful place. All 1.1 million acres of the BWCA have been preserved as primitive wilderness for over 90 years, and recent actions by Donald Trump now threaten to compromise this beautiful land. The Boundary Waters must be protected! We're happy to report that 11.35% of our total donations went to saving the BWCA. A percent of the proceeds from our Lake Superior products went to an organization that works to protect the Great Lakes. The Alliance for the Great Lakes has accomplished so much, like championing a federal ban on microbeads in personal care products to prevent them from entering the Great Lakes. They're working to prevent the transfer of Asian carp and other invasive species into the Great Lakes. And they've created the Adopt-a-Beach program and organized nearly 15,000 volunteers to clean up beaches and collect important data on the Great Lakes. Thanks to your purchases, the Alliance received 5.28% of our total donations. We recently released some Oregon wilderness products toward the end of 2017 and we've decided to donate a portion of the proceeds from these products to Oregon Wild. This non-profit works to protect and restore Oregon's wild lands, wildlife, and waters as an enduring legacy for all Oregonians. 1.08% of our total donations went to this wonderful organization. We love that, with the help of our customers, our Public Lands Pledge helps to conserve our beautiful outdoor spaces.